Students from Hillside School at the ILRI poultry research facility in Addis Ababa (photo credit: ILRI/Apollo Habtamu). The International Livestock Research Institute (ILRI)-led African Chicken Genetics Gains (ACGG) project is now hosting educational tours for students at the poultry research facility at the ILRI campus in Addis Ababa, Ethiopia. The guided visits to the facility, which is referred to as Incubated Worlds are targeted at students of grade 6 to 8 in public and private schools. acquaint students with new perspectives on livestock and related subjects. Olivier Hannote explaining about the genome book to students from Hillside School (photo credit: ILRI\Apollo Habtamu). 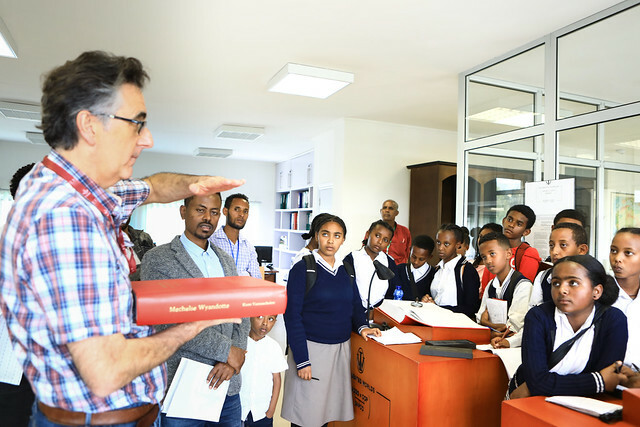 On 30 March 2019, the first group of students from the private Hillside School visited the ILRI campus and the poultry research facility. The group was made up of 25 students who were selected based on their academic performance and interests. 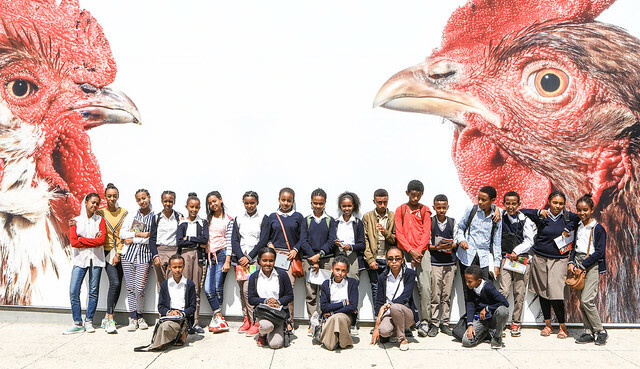 Dejene Mulugeta, a teacher at the school, who led the group said the guided educational visit would expose students to livestock research and encourage them to contribute to the country’s agricultural sector in the future. At ILRI, the visit was led by Wondimeneh Esatu, ACGG research officer and Setegn Worku, a geneticist at ILRI. The students saw the various chicken breeds (Koekoek, Sasso and Cosmopolitan), small poultry units and the genome book at the poultry research facility. The students said that they learned the importance of science and research for agricultural development, the nutritional benefits of poultry products and the role that ILRI’s research plays in improving the livelihoods of poor livestock keepers. More than 20 public and private schools (500 students) will take part in the guided educational visits during the 2019 academic year. The visits will take place once per month on Saturday mornings. Tags: Hillside School, research facility, school visit. Bookmark the permalink.